After meeting up with me as I sailed up the coast from Berwick to Arbroath, Katherine was due to depart on Wednesday 1st August. Apart from meaning we were able to be together after much time apart, having Katherine to provide ‘shore support’ and follow me round the coast with the camper van had been a welcome relief from the business of arriving at a destination and dealing with getting the boat out of the water, leaving it somewhere safe, sorting out accommodation or camping, cooking and so on. Even with Greg’s considerable help from a distance, the ‘off the water’ workload of solo canoe sailing had taken big chunks of time, often on top of long days on the water. My previous experience of canoe sailing expeditions in company have not included most of this extra workload. Campsites have been next to boat landing sites and remote locations have meant few security concerns. The time for reflection, analysis and lessons learned will be later this year, but I am now sure that if I ever plan another trip anything like this then it will be either in company or with a shore support vehicle for the duration. However, back to Arbroath. With the above in mind and after seven weeks of battling up the North Sea alone in poor weather and with repeated unseasonal northerly and easterly wind and waves, I was feeling I could do with a short break from the East Coast. 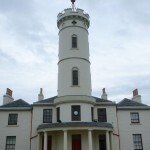 So I elected to accompany Katherine back to Dave and Hilary’s home at Grange, stay with them for two nights and then drive back up to Arbroath with Dave and Hilary who were going to continue the vehicle support whilst enjoying a holiday in Scotland. Driving south to the Lake District and staying with Dave and Hilary was indeed a welcome break and meant I could spend a little more time with Katherine before she took the train back to our home in Southampton. 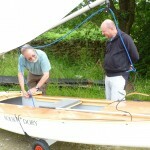 I was also able to meet Chris Wheeler briefly when he arrived to collect his new Mk 2 Shearwater Sailing Canoe like mine, from Solway Dory. He looked as pleased as I felt when I had collected Stacey, and he couldn’t wait to get on the water the next day. I’m hoping Chris might be able to join me for some part of my passage down the West Coast in a week or two’s time. Arriving back in Arbroath with Dave and Hilary on Saturday 4th August, feeling much refreshed, I took them to the boatyard where Stacey had stayed for three days. We found Stacey next to the cradle where a very large fishing boat had stood out of the water. My thanks are due to Paul Simpson of Mackay Boat Builders, who very kindly looked after Stacey while I was away and for free. We found a campsite on the north side of town and after pitching my tent as a fog descended, we returned to the harbour for fish and chips. These were eaten in traditional style on a bench next to the harbour whilst looking at a wide variety of boats, some of which were there especially for the annual Arbroath Sea Festival. We spent a while looking at The Reaper, a huge twin masted lugsail herring drifter. 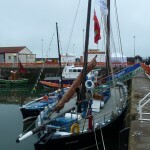 Registered in 1902 she is now based at Arbroath and sailed by the Scottish Fisheries Museum Boat Club. 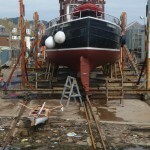 MacKay Boat builders and the Scottish Fisheries Museum Boat Club share the maintenance work. We also briefly met Alec who’d come up from the Tyne with three traditional fishing boats especially for the festival. Next morning at 6.30 the fog of the night before had mostly lifted so I woke Dave and Hilary. Dave busied himself with setting fire to the meths stove in the van but we managed to get it out and onto the grass before a wider conflagration ensued. Fortunately, the day was saved by my back-up stove which was used to boil water for strong coffee, whilst Hilary kindly made me some sandwiches. I was pleased to be able to launch and sail out the harbour by 8.15 but then had to return to show Dave how to find reverse gear for the campervan. Dave was having a bad day, later topped off by blowing up the cigarette lighter socket in the van and disabling the domestic electrics. However, I set off for the second time just before 9 and paddle-sailed northward under grey skies and in light winds. Long starboard tacks alternated with short port tacks out to sea and the skies slowly lightened to give bright sunshine by noon. The wide sandy expanse of Lunan Bay followed the tall dark cliffs north of Arbroath. Paddle-sailing alternated with just sailing and occasionally just paddling. By late afternoon I was approaching the top of St Cyrus Bay just South of Milton Haven where Dave and Hilary had found a perfect little campsite next to a stream and a small cove where I’d be able to land the boat. A haze began to form close to the sand dune backed beach, while to the north east the horizon disappeared behind a fog bank. Then quite suddenly I was enveloped in a thick fog with visibility down to 100 meters. Fortunately I been able to get a bearing on the top of St Cyrus Bay, of 330 degrees. I sailed a course of 320 degrees so as to approach the coast short of my destination, which would then enable me to short tack up towards Milton Haven within sight of land*. I find sailing in fog a bit unnerving but my plan worked and the St Cyrus Bay beach appeared out the fog just before the sun reappeared. Further fog patches and sunshine alternated as I cautiously tacked up the rocky coast north of St Cyrus to find Milton Haven where Dave was waving to me from the beach. Together we pulled Stacey up the steep shingle beach and above the tide line, before going off to the van for a cup of tea. * This is sometimes referred to as a navigational ‘built in error’ and means that when the coast is found there is some certainty about which way to turn to sail towards the intended destination. Without this, in fog there will be little certainty about which way to go when the coast is reached and a high chance of making the wrong choice – thus sailing away from a safe port, haven or landing.